Color, color everywhere! In recent years, soft blues and a slew of neutrals have dominated many design color palettes. But over the summer we've seen spike in bright, vibrant colors, particularly shades of coral. The pinkish-orange shade is a popular option for adding life to any room. Mixed signals. Successfully mixing patterns and textures is an art, and more and more designers are taking chances to mix it up. Florals + geometrics, linens + embroidery and just about any other combination you can think of are making their way to mainstream designs. Custom pillows. Don't get us wrong, we love a good pillow from Home Goods. But custom pillows like in the photo above with custom cording and funky box edges were all over the ADAC showrooms. Need a weekend project? Give an old pillow a fresh look by adding a brush fringe or appliqué. If it doesn't work out, we're always here to help you design your dream pillow! Alright, full disclosure: while on our trip, we did get lost in an Atlanta mall looking for the Kate Spade store and ended up stopping for cupcakes instead... But who hasn’t done that? 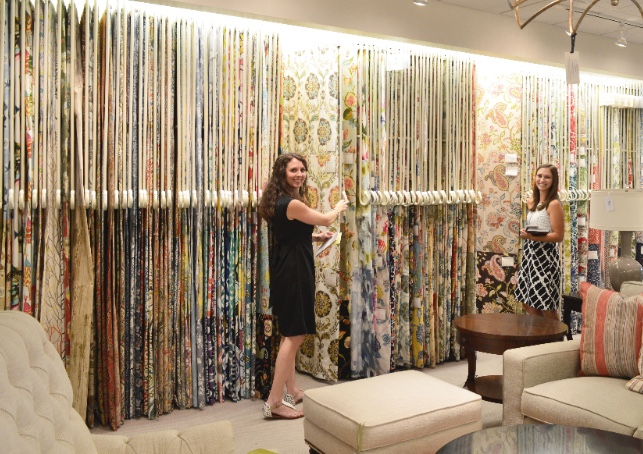 We had a great time sifting through fabric samples and drawing inspiration from the showrooms there. For more of the tips and tricks we picked up on the trip, remember to follow us on Facebook and Instagram. ‘Til next time! Newer PostAnd the Votes Are In! Older PostA Toast to Music City!